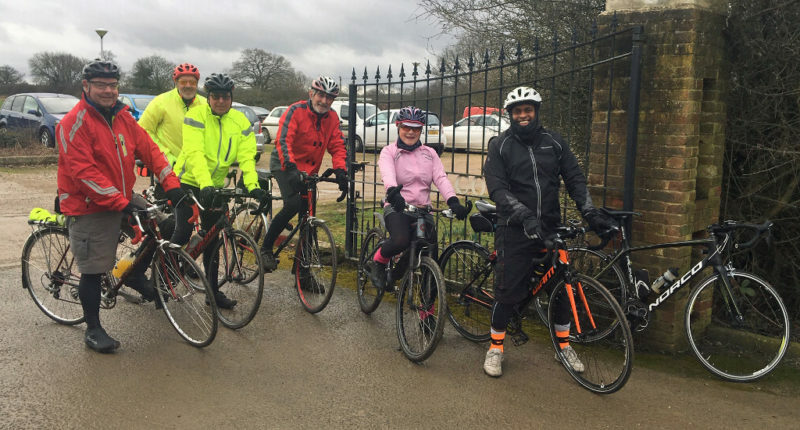 Several members had spotted that Saturday was going to be the best cycling weather of the weekend so we had a decent turn out of seven members considering the cold weather. Jason was waiting at Shurguard for his first ride out with the Saturdays. There were only two of us at the start but this increased with several scheduled meet-ups on route and one unscheduled encounter at the tea stop. Heading along the Brighton road towards Farthing Down we met up with Roger, and then Karen at Coulsdon PO and onwards to Chaldon to meet up with Graham. Roger appeared to have got away with riding over a glass bottle near the start but the puncture fairy caught up with him at Chaldon. Fortunately Graham had turned up with a decent pump so we were eventually able to head onward via Bletchingly and Outwood a pleasant ride with the sun making an appearance briefly. Horne Golf Club is proving to be a favourite place to stop. They are very cyclist friendly with tea, coffee and food reasonably priced and in pleasant surroundings. Mick and Ian were already there when we arrived and joined us for the return home. Returning via Lingfield Roger had a second puncture so bailed out to the train station. The rest of us took the familiar route back via Crowhurst, Marden Park and up the Zig Zag. Just three of us headed to the Wattenden Arms for a quick drink, Roger joined us too, We left just as the rain started, so good timing and an enjoyable ride. Copyright © 2019 Anerley Bicycle Club. All rights reserved.